A recent analysis of data over the past two years revealed some very interesting findings. Of all of the freshman that accepted scholarships to play basketball in the Atlantic 10 (A10) Conference over the past two years – 2013 and 2014 – 52% would NOT have been eligible if the 2016 NCAA eligibility guidelines were already in place. Through analysis of SAT test score data and discussions with concerned HS Principals, HS coaches, AAU coaches, parents and student-athletes it was determined that Black student-athletes in the mid-Atlantic Region (NY, NJ, PA, DE & MD) were particularly at-risk of not meeting the new guidelines. Another area that may experience significant problems is Jackson, Mississippi. 1) Disseminate information and increase knowledge of NCAA, NAIA and JUCO initial eligibility guidelines: The NCAA will implement several significant and increasingly stringent freshman eligibility guidelines. These guidelines will take effect on August 1, 2016. 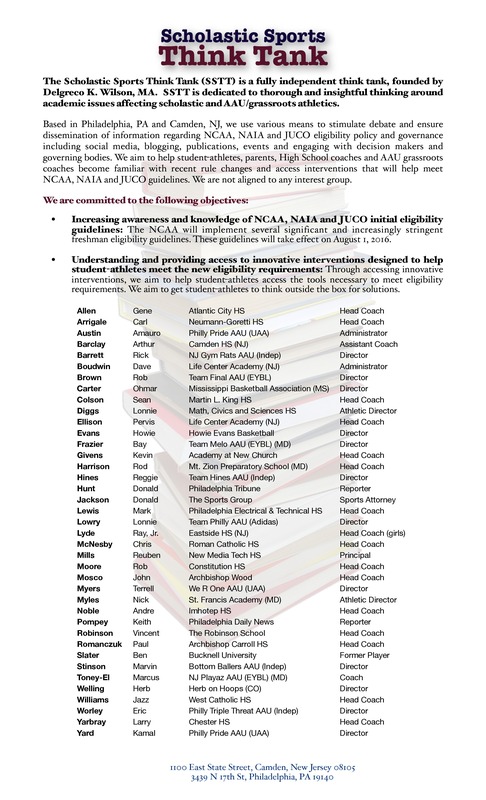 2) Increase understanding and provide access to innovative interventions designed to help student-athletes meet the new eligibility requirements: Through accessing innovative interventions, we aim to help student-athletes access the tools necessary to meet eligibility requirements. We aim to get student-athletes to think outside the box for solutions. For many of our youth, athletics is the means to accessing higher education. SSTT will work to help our youth understand what they need to accomplish in order to be eligible for athletic scholarships. Look for announcements for FREE full-length practice SAT exams and transcript reviews. « DeAndre Hunter, Charles Brown & Sean Colson: It’s that Philly Pride! Especially as budget troubles have forced many urban schools to reduce Guidance Counselor staffing educating coaches and young players and their families on how to plan for these new standards is critical if talented young people are going to be able to keep their dreams alive through athletics.